Posted by Stu on 2009/11/15. Ok, so I’m still not keeping up with the days too well, but technically I’ve had more blog posts than the sprint has had full days (I cheated by blogging on day zero). Anyway, this post is about day 2. I think. Yesterday – day two – we started off with another discussion about the rebranding, repeating a few steps from the day before but coming quite quickly to some conclusions and a concrete proposal written up by Cornelius. This is still being discussed internally with some of the people who will be most affected and so I can neither confirm nor deny rumours that the workspace in 4.4 will be known as “Ferrari” and that Konqui is going to be retired and replaced by a prancing horse known as Shergar… There will be an announcement about the real names on the Dot in due course. 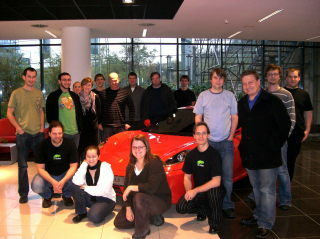 After that, we got down to work on the release announcement for the 4.4 release of the KDE Software Compilation. Apparently writing it more than a couple of weeks before release is a new experiment. Jos had a draft already and he, Luca, Claudia and myself spent some time going through that in great detail to get the wording just right. We also managed a bit more work on the FOSS.in booklet adding a lot of new content in the big sections about KDE applications. 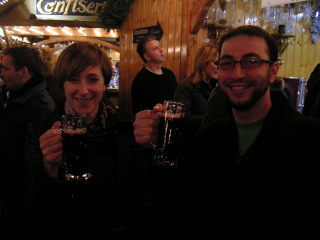 In the evening we headed to the market at Schlossplatz for some gluhwein – first time I’d had that actually in Germany. Then we headed for a curry so for once I didn’t need menu translations 🙂 A few beer enthusiasts (perhaps not surprisingly they were all German, except me) headed for an extra beer afterwards too. Still, we made it in for 10am in the morning and this time remembered not to leave Luca behind at the hotel. Today’s work I’ll blog about later today or, most probably, tomorrow. You may have noticed the Dot disappeared for a while – this happened halfway through a meeting of the Dot editors but we’re convinced it wasn’t us 🙂 Anyway, it seems to be back now.